When I received this monograph about a civilian airliner that saw limited use, I said to my self: ”boring”. But this was clearly a case of you can’t tell a book by its cover. The book opens with a short biography of Prof. Dr-Ing. Hugo Junkers. I always assumed that Dr. Junkers lorded over a vast aircraft design and production company. I could not have been more wrong. While Junkers did develop the first all metal single seat fighter in 1915, most of his life was a struggle to keep the aircraft business going. Immediately after the Nazis came to power, Hermann Goring and Erhard Milch made him a deal he couldn’t refuse; either turn over all Junkers’ patents to the state or be put on trail for treason. The same deal was struck with regard to his ownership of the company. In the September of 1933, Junkers handed over his stock to the RLM and was relieved of all his duties and offices. Hugo Junkers died, while under virtual house arrest, in February 1935. Most of what we associate with Junkers was the result of the work of Dipl.-Ing. Ernst Zindel. The book next turns to the development of Junkers civilian aircraft leading up to the Ju 90. Junkers’ signature of aircraft design was corrugated sheeting, beginning with the all-metal J1 in 1915. The monograph even gives a brief over view of the development of Duraluminum. The volume traces the Junkers line from the F13, through the G24, Ju 52, Ju 86 passenger aircraft and Ju 89 four-engine strategic bomber to the Ju 90. What is fascinating is that the author not only describes the development of the Junkers aircraft, but also discusses the competition. In the case of the Ju 89, it was the Do 17. For the Ju 90, the Fw 200, Arado 390 and Douglas DC-4/DC-4E, among others, are discussed. The author then takes us through a part by part technical overview of the Ju 90 – fuselage, wings, passenger cabin, power plants, etc. This section is filled with excellent pictures and drawing and diagrams. Although a magnificent aircraft, only 11 Ju 90s entered Lufthansa service. The ones intended for South Africa never were delivered. 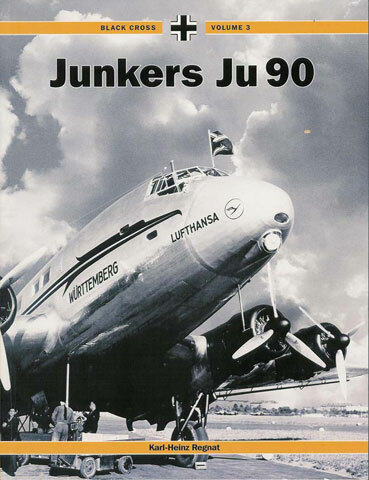 The book discusses the Ju 90 in Lufthansa service, and describes the life of each of the 11 aircraft. But the civilian role of the Ju 90 came to an abrupt end in August 1939. Many of the Lufthansa Ju 90s were handed over to the Luftwaffe for transport and training duties. Finally, it was the Ju 90 that became the basis for the Ju 290. Although the Ju 290 is not discussed, there are a few picture. The book concludes with a short piece on modeling the Ju 90. The kit used is a long out of production Air-modell vacuform kit. It is a shame that a kit of this aircraft is not available, as even that old vac kit was built into a beautiful model of a graceful and elegant aircraft. I don’t want to forget to mention that this monograph is filled with great photographs. Text and pictures go hand in hand to give a great overview of the Ju 90. Far from being boring, this monograph was fascinating. The author was able to bring in so many diverse elements, yet integrate them virtually seamlessly. I highly recommend this monograph to anyone who has an interest in inter-war civilian aircraft, or Junkers aircraft. A well done job indeed.